GREAT idea for a new book! I've got the other JW books but sadly, as you know, original art for the most part is very minimal. If this new book is half as good as your Magoo book I'll be proud to own it! I'm going to email you later about some original drawings(storyboard?? 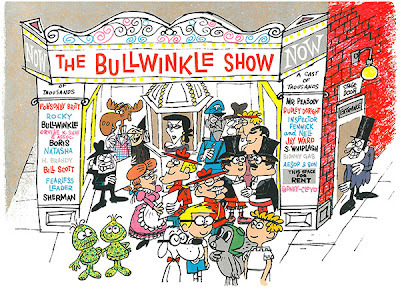 )I bought several years ago from an Ebay seller in Mexico and I have fairly good quality scans of a lot of the Bullwinkle comic strips by Al Kilgore. Looking forward to seeing what's in store for this book. I've got a couple issues of the "Bullwinkle and Rocky" comic book from the late 70's and recent photographs of the Bullwinkle Fun Center in Seattle if you're interested in either of those. My father Duane Crowther free-lanced for Ward among others for many years- mostly commercials but I do remember him animating a Tom Slick episode and probably some other of Ward's entertainment shows. Unfortunately I have no artwork to contribute, (I have stuff from his Duck Soup years but nothing from his free-lance days) but I wish you luck with the project! At this point, I'm only looking for original art, whether it's from the TV productions, comic strip or comic books. Glad to know that Duane worked on some of the Ward productions. I've come across several artists now that didn't do enough to receive screen credit but should be recognized in the book. Do you remember which episode he animated on? Hi this is such a great idea for Christmas. Christmas is fast approaching, hoping it's gonna be a happy year for us! Sorry, the only thing I remember is visiting a studio as a teenager in Toluca Lake and seeing he was working on a Tom Slick episode. My most vivid memories are of his work on the commercials, I know he did as least several Quisp and Quake spots and some Cap'n Crunch ans probably others. His widow Cathy may know more. Someone has identified the Tom Slick episode now and I am also in contact with Cathy. Thanks for writing back! What episode of TS was it? I wonder if is on any of the R&B DVDs? The episode is titled, "The Cheap Skateboard Derby" and is on the George of the Jungle DVD set. 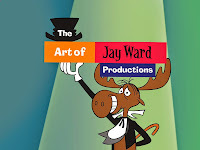 I wish you very well on your project to produce the Jay Ward book. A nice, appreciative and intelligently-written one would be most welcome, especially after the dreadful Chuvonic (sp?) book of some years back. I recall after speaking with Jay Ward's wife, Ramona, who was looking forward to the publication of this proposed "coffee table" volume on the work of her husband, how utterly disappointed I was in it when it came out. Perhaps the whole disastrous tone of the book was set by the introduction by the creator of "The Simpsons", who isn't in the same class as Ward and Scott. Thanks for your kind wishes. I don't know of anyone who wasn't disappointed by the Rocky and Bullwinkle book. It appears to have been mostly about art direction and not about the art. I'm in rough layout on the book now and can assure you there will be plenty of great art to drool over.